A Crazy Vacation Idea; The Baja 3000! GO DIRECTLY TO THE TRIP! Drive far, surf hard, challenge your ingenuity and tenacity in the desert. Then, give everything away…including your car! In March, 2008, five teams of surfers will pile into four-wheel-drive trucks and negotiate 1600 dusty, bumpy miles to Mexico in the search of solitude, perfect waves, and people in need. We will load our vehicles with 5000 pounds of clothes, toys, books, bikes, tools and other essentials. As we pass through poor Baja villages, we will donate everything—including the much-needed 4WD trucks—to recognized charities. In all, we hope to make donations worth more than $30,000. We invite you to watch the action on this web site and blog. We’ll update it frequently with stories, photos and videos. We also invite you to make a donation to the Baja3000 of money, toys, books, supplies, educational materials, and other items. Your donation will go straight to the hands of needy kids and families. The trip, dubbed Baja3000, is governed by a set of rules designed to maximize donations, ingenuity, teamwork and grit. Each two-man team may spend no more than $3000 for everything—vehicle, food, gas, license, and tolls. Points are awarded for a variety of tasks ranging from doing one’s own vehicle repairs or rescuing stranded motorists, to surfing fabled out-of-the way breaks. Scores will be tallied and a coveted Baja3000 trophy will be awarded once teams all reach Cabo San Lucas. The team has planned the trip to maximize great surf opportunities, as well as make donations in out-of-the-way towns. Baja has been a primary destination since the beginning of the guys’ surf trips, back when we couldn’t afford much. Back then, surf trip was a drive across the border, camping and cooking our own meals on the beach, and surfing. There are many reasons we wanted to make a trip like this one. First, all of us love surfing, and Mexico has warm water and some of the world’s best breaks. Second, coming down here for two decades, we’ve come to know and respect the wonderful people here. It seems right that we should give something back. Third, we wanted to get back to our roots as surfers. The trip is purposely designed to test our ingenuity, inventiveness, and creativity under harsh conditions. We’re operating under strict financial limits, just as we did as younger surfers. It’s as close as we can get to the original spirit of surfing on a shoestring. The team will be supporting a number of worthwhile charities all along the Baja Peninsula. In addition, team members will donate supplies, used surfboards, toys and other items in towns and villages along the peninsula. Most of the charities have been personally pre-scouted by Baja3000 team members, who evaluated them for quality services, outstanding management, and effective programs. A. Classroom on Wheels: is run by Mexican and American volunteers. Every day, the volunteers go out to migrant labor camps and bring toys, games, educational activities to kids. The program we are targeting is in Todos Santos, about a 90 minute drive north of Cabo. These labor camps house “the poorest of the poor.” These are company-built shantytowns run by large growers in this part of Mexico. The program touches about 500 kids each week. B. Special Needs School: also in Todos Santos, helps 20 kids ranging in age from 18 months to 22 years. The kids have autism, deafness, mental retardation, Downs’ syndrome and several other challenges. The school’s library has only about 50 books, water doesn’t work in the restrooms, no internet connection and even basic supplies such as paper and pencils are in short supply. C. Communidad Biblica de Cabo San Lucas: This organization helps more than 120 poor families with social services of all kinds. The team plans to donate several vehicles to families who will use them for work and school. The guys have been taking surf trips together for more than 2 decades. The guys have enjoyed incredible surf, local culture, adventure and camaraderie. 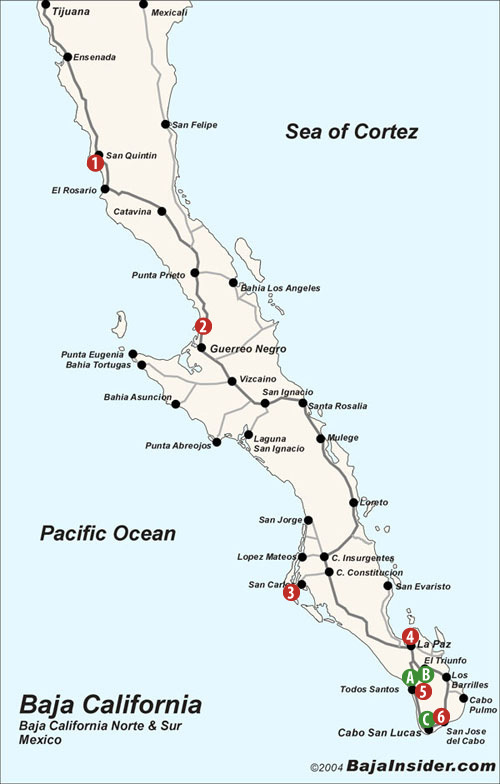 Check out some of our past trips, they include Mexico, Ecuador, Galapagos Islands, Namotu Fiji, Hatteras North Carolina among others. The Baja 3000 has just ended. Stat tuned for a trip recap and photos. Sign up to receive e-mail notificaitons whenever a new post is made to this blog.